So my Cruze TD has about 55,000 miles on it now, and has been mildly trouble-free. I've had several emissions-related trouble codes, as well as the annoying "Poor Quality DEF" light come on multiple times. Being somewhat technical minded, and after perusing several delete threads, I've decided to give it a go, with the intentions of paying now to save later. I plan on keeping this car for at least another 5 years, well past the warranty, and would like to knock out the very expensive emissions system that has the potential to be a ticking time bomb. Also, I am not a big fan of other people telling me what I can\cannot put on my car, so doing this feeds my Libertarian leanings . I've had the car for almost a year, but lost my mileage records in August, and had to start over again. Since then, my average MPH has been 39 MPH. So far, the car is averaging 38 MPG in a mix of winter and summer blend diesel, lots of city driving (lowest MPG for a tank is 26, highest was 53), and a few long trips mixed in. I run AMSOIL for the motor oil, and will be switching the transmission fluid out to AMSOIL soon, too. 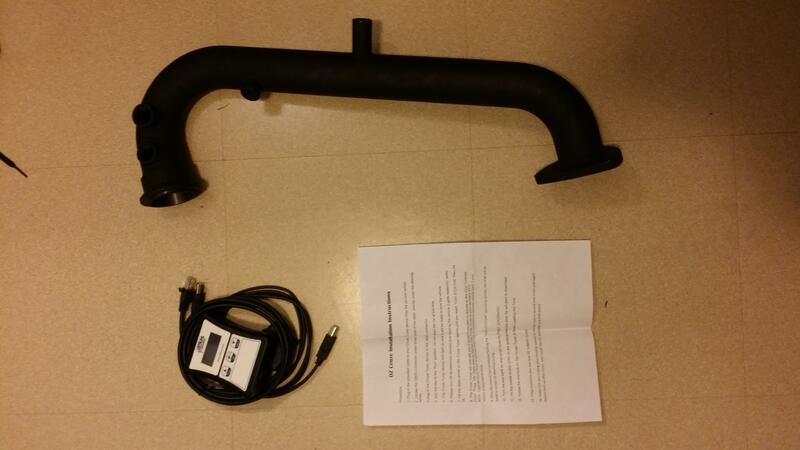 Total cost with the military discount on the Oz Tuner\new down pipe was $1227.60. I decided against the EGR block kit, since they shut the EGR off in the tune. As often and as best I can, I will update this thread with new results. KpaxFAQ, silver14diesel and MRO1791 like this. So, you do not care about other's health? That is what you are saying? Because Libertarians do not care about the environment?? Anybody you care about have severe allergies or ASTHMA? Because if you do, you are literally jamming your arm down their throat and squeezing their lungs. But hey, if you want to spend $1227.60 to help make others suffer, that's on you. I just hope they enact Diesel emission inspections. Have a nice life. Great, I'll be doing the same thing when the weather breaks. Keep us posted! Last edited by KpaxFAQ; 02-09-2017 at 02:17 PM. He may actually be doing you a favor! The additional cost burden of DPF filters is primarily passed to consumers with possibly the only benefit being quieter trucks. Any reduction in overall soot by mass, aka diesel particulate matter (DPM), may be negated by the mostly-ignored fact that DPM from DPFs is extremely fine, finer than the DPM that is released from pre-DPF diesel engines. The finer DPM is estimated to have more surface area and penetrate lung tissue more easily than larger particles. No healthy human studies have been performed at diesel exhaust concentrations normally found in an urban or city environment, eliminating other health contributing factors to disease would be insurmountable in such a study. Merc6, izzone2000, 91794 and 3 others like this. I work at a Chevrolet dealer; let me know if I can help! False equivalencies and strawman arguments won't suffice here. I don't mind if you disagree with my decision-in fact, I welcome opposition and corrections- but you'll have to do better than that. If you truly believed what you just wrote, I think you'd be far better off protesting at truck stops and diesel truck pulls. My puny 2.0L diesel will have zero effect upon your health, or anyone else's for that matter. With regards to the build, I want to be as upfront and honest as possible. Politics aside, I feel that practically and mechanically speaking, this is the lesser of two evils for this engine. Given that I want to keep it in the family for many years, I believe that installing these race parts will better serve that purpose, cost the least, and also put a bigger smile on my face when I mash the skinny pedal. If diesel ever goes back to $4 and $5\gallon, it will definitely help pay for itself, but I doubt that it ever will. This is more about a) fixing issues from the factory\EPA, and b) my propensity to modify and customize, especially where I see heavy-handed interference into my personal possessions. Update: Fleece is a bit iffy on the customer service side. I'm not one to complain, but for $1200, you'd think they would take care of customers better, especially given that we're supporting their skirting the edges of the law. They won't provide instructions on how to do the install, and they never did send any kind of tracking number or shipment notification. However, I did receive the package today, after ordering it 2 days ago. They also knocked off 10% for my wearing the US flag on my shoulder. All that comes in the package is the EFI Live tuner, 2 cables for the tuner, the hand-built down pipe, and a set of instructions for the tuner that seem to be have been written by a 2nd grader. Again, not to pick a bone with Fleece off the bat, but numerous grammar errors, plus a down pipe that already needs a re-coat of paint... we'll see how the finished product is. The welds on the pipe and bungs aren't exactly 5 out of 5 stars, either, but all I need is for the tune to be spot-on, and for the pipe to fit and not leak. Going to try to install this weekend or next weekend. KpaxFAQ, BradHerr, Smoothride and 3 others like this. Just ignore the troll and keep the thread on point. Even acknowledging the post is like voluntarily banging your head on the wall. starspangled6.0 and MRO1791 like this. With the downpipe do you basically just remove the DPF, install the downpipe in its place and leave all the sensors on the rest of the pipe in place even though they're dead? I believe so. I'm guessing the engine will still need some of the oxygen sensor(s) to adjust the air\fuel ratio, but other than that, I don't know what else will be vital to keep it running without a CEL. There are 4 bungs on the Fleece pipe. Ok, just curious because I figured there would be some kind of basic instructions related to that. I guess not. I'm ok to work on cars but I'm not a diesel expert or tuner guy so it's all new to me.